From a land far far away… there’s a dish you simply can’t resist! Filled with rice and packed with seaweed… but raw fish is also something you can eat! Anyway, enough with the rhyming! It is time for EXPEDITION SUSHISON! During this race through the city center of Utrecht, you’re facing fiery challenges where you and your team have to collect as many points as possible. That is because can exchange the points for ingredients. After the challenges, there will be a battle to see which team has the best sushi rollers! Even though it may look delicious, will it taste wonderful as well? Well, we’re going to find out when we’re going to eat our self-made sushi! IMPORTANT: Do you want to participate but you have allergies? Please let us know before the race begins! You can write this down in the form. You can always talk to us from Geprakt or you can email to geprakt@akt-online.nl. Do you think you will collect all the ingredients? Do you think you are the mastermind who faces all challenges? Are you going to roll that sushi role as if your life depends on it? 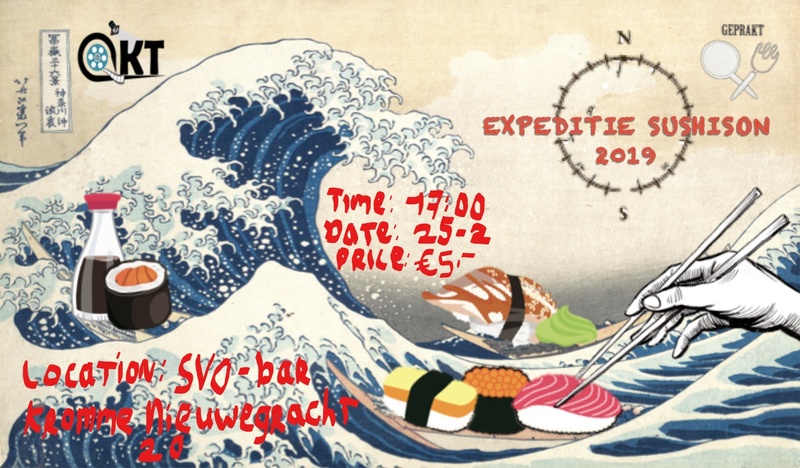 Sign up and maybe you’ll be the winner of EXPEDITION SUSHISON 2019!